Fresh chicken builds and maintains lean muscle. It’s a high-quality, highly digestible protein without any added hormones, steroids or antibiotics. We use fresh vegetables in our recipe to deliver Beta Carotene (Vitamin A), Potassium, Niacin and B vitamins right from the source. As natural sources of antioxidants like Vitamin C and E, cranberries and blueberries support your pet’s immune system and help prevent urinary tract infections. Excellent sources of pectin, a soluble fiber associated with colon health. 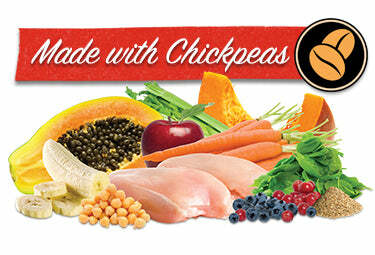 Chicken, Chickpeas, Flax, Carrots, Celery, Apples, Bananas, Blueberries, Cranberries, Pumpkin, Papaya, Spinach, Garlic, Vitamin A Supplement, Vitamin D3 Supplement, Vitamin E Supplement, Niacin Supplement, Iron Proteinate, Calcium Carbonate, Phosphorous, Zinc Proteinate, Riboflavin Supplement, Thiamine Mononitrate, Potassium Chloride, Manganese Proteinate, Copper Proteinate, Magnesium Chloride, Pyridoxine Hydrochloride, Vitamin B12 Supplement. Chickpeas are full of flavor with naturally occuring dietary fiber, folic acid, and protein. This encourages a slow energy release to help maintain a consistent energy level. Stir well and let stand for 3-5 minutes. After 3-5 minutes, food may be served. Grandma Lucy’s Pureformance Chicken Recipe is formulated to meet the nutritional levels established by the AAFCO Dog Food Nutrient Profiles for All Life Stages.